PCS:Law solicitor, Derek Dawson, returned to his former Aigburth school to share his experiences with current pupils. The Liverpool lawyer returned to his former school, St Margaret’s CE Academy (SMA), to deliver an informative talk to Year 10 – 12 pupils about careers in law this week (13 December). PCS:Law is the commercial division of Paul Crowley & Co solicitors, based in Liverpool’s commercial district. 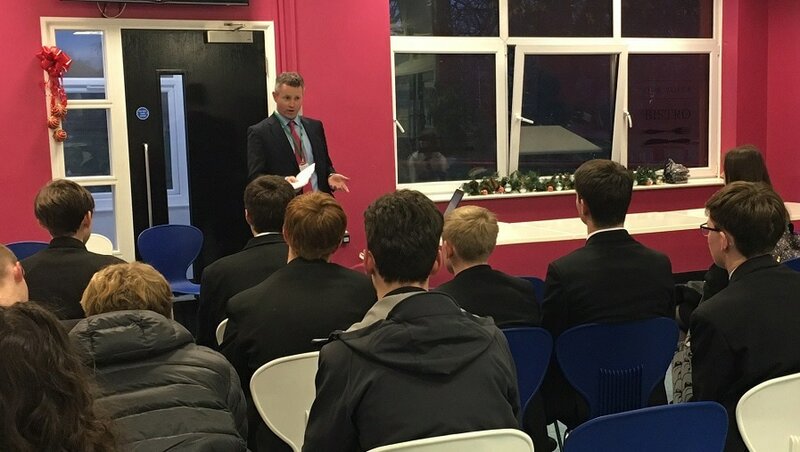 Derek talked to pupils about his role as head of commercial litigation at the leading Liverpool law firm as part of the school’s newly launched ‘work inspiration programme’. SMA’s ‘work inspiration’ programme delivers weekly careers talks from selected industry professionals, giving students key information on various vocational options. Students were keen to hear about routes into the legal profession, how long it takes to become a qualified solicitor, different specialisms within the law, as well as potential earnings. A representatives from the University of Liverpool Law School also attended the event to answer all of pupils’ questions. Greg McLean, careers at post-16 data manager at SMA, says: “It was great to welcome Derek back to St Margaret’s with his wealth of knowledge and experience. As a former student, he was able to offer a former student’s perspective on careers in law and gave a very insightful and engaging talk about options open to students”. “In such a highly competitive job market, it is vital students have all of the necessary tools to help them achieve their career aspirations, and our ‘work inspiration programme’ is key to equipping pupils with the right skillset to help them progress and succeed. I am very grateful to PCS:Law and in particular, Derek, for giving up his time to speak with our students”.